Saturday 2nd August. 10am-4pm. Getting to grips with pots & pipes: the archaeology of everyday artefacts from Saxon times to Queen Victoria. Day workshop at Stephens House & Gardens. Please see July 2014 newsletter or website for details and how to book. It is not too late! Sunday 3rd August 1.30pm. “A Hamlet in Hendon: The archaeology and history of Church End from excavations at Church Terrace, 1973-74”. Book launch at The Greyhound Public House for HADAS members and invited guests. Please see July newsletter or contact Jo Nelhams for more details. Tuesday 8th October at 8pm: Finding Neanderthal tools in Norfolk cliffs. Lecture by Dr Nick Ashton of the British Museum. Tuesday 11th November at 8pm: A Hamlet in Hendon –the Church Terrace site from the Mesolithic to the 21st century. Lecture by Jacqui Pearce. Jacqui is one of the principal authors of our latest book, and tutor of the HADAS Finds Group whose work over many years resulted in the publication of the 1973/74 excavations. Membership Renewals – a reminder. Stephen Brunning. Many thanks to everyone those who has paid their subscription. At the time of writing however 28 members have still to do so. If you intend to renew this year, I would be grateful to receive payment by 1st September 2014 at the following rates: £15 (Full), £5 (each additional member at the same address), £6 (student). My address is on the last page of this newsletter. It is not necessary to return the renewal form enclosed with March’s newsletter. A piece of paper with your name, postal address, telephone number and email address (if applicable) will suffice. I will then be able check the details we hold are still correct. It would also be helpful if you could indicate your willingness to receive the newsletter by email. This helps to keep our costs to a minimum. Thank you. The lecture on 8th April 2014 by Brian James Strong and Beverley Charters was advertised as “House Mill and its restoration”. On our return journey from the trip to Kent, we were able to fit in a visit and learn more about this important site. The write-up below is an amalgamation of the lecture and our visit. Thanks to Vicki Baldwin and Harry and Marilyn Burgess. Last but not least on our holiday jaunt, was our visit to Three Mills Island on our homeward journey. As some HADAS members may recollect, Three Mills Island was featured at the April meeting, so it was good to visit the site so soon afterwards. Upon our arrival at the mill, the group assembled in the visitor’s information centre where we were afforded hot drinks, and given a brief overview of the site. We then split into two groups and were taken on a tour of the mill by our knowledgeable, enthusiastic guides. “Probably the largest tidal mill in the world”. The House Mill is a Grade 1 listed 18th century tidal mill. It is located on a man-made island 1 mile north of the confluence of the River Lea and the Thames at Blackwall. Milling had taken place in the area for over 1000 years and mills are recorded in Domesday. These would have been watermills, as windmills were not introduced until later and the area was known as Three Mills from Medieval times. As a result of the Dissolution of the Monasteries the mills, part of Stratford Langthorne Abbey, were sold. It is known that they milled flour for the bakers of Stratford who provided bread for the City of London. Flour was not the only product. In 1588 the milling of gunpowder for use against the Armada was recorded. In 1728 the mills were part of the distilling industry and were run by the Huguenot Peter Lefebvre. Coopers and carpenters also worked on the site which had its own piggery utilising the waste products from the distilling. By 1776 Daniel Bison was in charge and he and his son built the House, so-called because it was set between their two houses. Both Bisons died in 1777 and the mill passed into the ownership of Philip Metcalfe, a friend of Samuel Johnson. In 1802 the mill was burned down but then rebuilt. Following the death of Metcalfe in 1819 the mill was neglected until taken over by Nicholson’s Gin in 1872. The two stages of distilling gin were not allowed to take place on the same site and the raw spirit was stored “in bond” until taken elsewhere for rectifying. At its point of maximum use, the House Mill had 4 waterwheels running 12 pairs of millstones. The nearby Clock Mill had 3 wheels running 6 pairs of stones. Production was in shifts, using the power of the river on the ebb tides, with milling for 6-8 hours per tide compared to a steam engine which could work for 24 hours. Production continued on the site, and also pig farming was introduced with up to 5000 pigs being kept in its heyday. The site was eventually owned by Nicholson’s Distillery, and the mill was last operational in 1941, when the area was bombed during the Second World War. An unlikely tale tells that the River Lea burned for a week due to the barrels of spirits from the bonded warehouse. Probably not, though! Sadly, the mill then fell into disrepair, and became derelict. A number of the millstones were removed in the 1950’s as they were valuable and were sold to the cosmetics industry. The battle to prevent demolition began in the 1970’s, and since 1986 it has been owned by the River Lea Tidal Mill Trust. The Trust began work in 1989 to preserve the mill and rebuild the miller’s house. While the area was being prepared, the original marble and Portland stone floor of the miller’s house was discovered along with between 1,480 and 1,500 roof fragments. It was also found that the house and mill were built on an artificial island and the original piles from the 1763 house were uncovered. It appears that the piles had been driven in, planks laid on top and then the brick walls were constructed! The mill building has now been fully restored. The House Mill has been afforded English Heritage Grade 1 listed status. The 5-floor mill itself is of timber frame construction with brick cladding. Some of the timbers had been recycled from the hulls of old ships. The shape of these allowed the building to flex and probably contributed to its survival. The mill has a 19th century Poncelet waterwheel with curved float and Fairbairn’s “Silent Millstone Machinery”. These were still in use in the 1930s, and apparently use gravity and centrifugal force thus dispensing with the “damsel”. 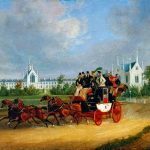 It cannot be claimed that Fairbairn (1789-1874) actually installed the system, but it is possibly the only surviving example. In addition there is the Pattern Store containing a complete set of wooden patterns – all recorded but not all the functions are known. The House Mill remains a reminder of the vibrant industrial heritage of the River Lea and the Thames. There is still much that the Trust wishes to do to realise their plans for the House Mill. At present it offers a fascinating glimpse into the past and “probably the largest tidal mill in the world” is well worth a visit. The area of the East End of London has since had an enormous regeneration project, in preparation for hosting the 2012 Olympic Games. As a result, the River Lea is no longer fully tidal, as a dam was put in place, prior to new housing being built. The House Mill has been given a £2.65 million grant by the Heritage Lottery Fund, to restore the machinery of the mill and provide wider community benefits. For HADAS members wishing to visit the site, it is just a short walk from Bromley-by-Bow underground station. Tours are conducted on Sunday from May to October. A word of caution; call before visiting, as the site is manned by volunteers, and on a previous visit Jim had found them closed on arrival. Arts depot will celebrate its 10th birthday in October 2014 and has embarked upon an ambitious heritage project, Tally Ho: A Place to Meet, in partnership with the Finchley Society, supported by the Heritage Lottery Fund. We are looking for members of the community to help bring this project to life by feeding into an exhibition and oral history archive focused on two periods in the history of the artsdepot site – The Tally Ho Coach Company (early 19th century) and the Gaumont Cinema (1937-1980). Do you have photos, posters, ticket stubs, programmes or other materials relevant to the history of the Gaumont Cinema or the Tally Ho Coach Company? We’re looking for willing volunteers to take part in oral history interviews, which will be contributed to local archives. Do you have memories about the Gaumont Cinema that you would like to share? If the answer to any of these questions is YES, please contact the heritage project team to discuss how you can get involved. HADAS Long Outing to Kent. Day one: Canterbury. Sunday 29th June and the intrepid Hadasians sallied forth from the fastness of Barnet to follow in the footsteps of Pilgrims to Canterbury, their base during their exploration of the County of Kent over the next five days. Appropriately, their first port of call was the Cathedral and Metropolitical Church of Christ at Canterbury, to give its full and proper title, which has been a place and centre of Christian worship since the time of the Romans. The etymology of the name Canterbury can be clearly traced in the successive variants of the name: It was an important pre-Roman centre for the local Celtic tribe the Cantiaci; Durovernum Cantiacorum was the Roman name; and Cantwareburgh the old English. The word cathedral comes from the Latin Cathedra = seat i.e. the seat or base of a bishop. It is said that from the tiny acorn a great oak grows; and so it certainly was in the case of Canterbury. In 597 CE the Benedictine monk Augustine, at the behest of Pope St. Gregory (the first of sixteen of that name and often called Gregory the Great), led a mission to the pagan king of Kent Aethelbert and his Christian wife Bertha. Augustine’s mission was to bring Christianity to Kent and beyond. Thus from an acorn sown in the soil of Kent in 597 CE did the National and International importance of Canterbury spring. It is an amazing story. Augustine was the first Archbishop of Canterbury and Justin Welby, Augustine’s successor is the 105th Archbishop and Primate of England. 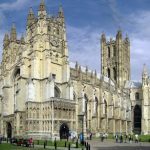 The Church of England, focused on the See of Canterbury, is regarded as the Mother Church of the worldwide Anglican Communion and the Archbishop of Canterbury, the symbolic head of that Communion. There are 37 Provinces, covering 165 countries, in the Communion all linked by history and doctrine to Canterbury. Let us not think that Christianity did not exist in Britain before Augustine. It did! – on the Celtic fringes but it had become isolated from the See of Peter in Rome. enfold it would take volumes. One could explore the Cathedral for days and even then barely peel back the layers of the history of this magnificent structure. If Augustine was the first Archbishop to put Canterbury, as it were, on the National Map, it was Thomas Becket, the 39th Archbishop who saw it gain international prominence – at least in the context of Europe. Thomas achieved this by sacrificing his life in the heart of the Cathedral on the 29th day of December 1170 when he was assassinated by alleged emissaries of Henry II the Angevin King of England, Lord of Ireland and ruler of more than half of France. Thomas was proclaimed a martyr and within two years of his death canonised a saint. Thomas’s tomb became a shrine and an International Centre of Pilgrimage. 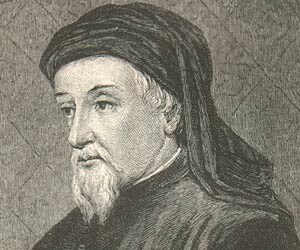 Our own Geoffrey Chaucer, father of English Literature, wrote of those pilgrims in his “Canterbury Tales”. 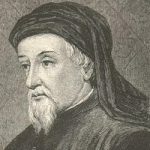 Chaucer is a crucial figure in developing the legitimacy of English at a time when the dominant literary languages in England were French and Latin. Chaucer’s sister-in-law was Katherine Swynford, third wife of John of Gaunt and stepmother of Henry IV, also buried in the Cathedral, of whom we will hear more anon. Becket’s shrine was dismantled and destroyed on the orders of Henry VIII. Nothing of its magnificence remains. The actual site of the martyrdom is a cross before which is a prie-dieu where on May 29th 1982 the Bishop of Rome, John Paul II, and the Bishop of Canterbury, Robert Runcie, knelt in prayer for the unity of Christendom. Two tombs in the Cathedral have echoes resonant of the Wars of the Roses, that dynastic internecine conflict. On the north side of Trinity Chapel, and directly adjacent to the site of the shrine of St. Thomas Becket, is the tomb of King Henry IV (Henry of Bolingbroke, Lincolnshire) the usurper Lancastrian King who deposed his first cousin Richard II and seized the throne of England for himself and his heirs. On the south side of the shrine lies Edward of Woodstock (later known as the Black Prince) Henry IV’s uncle and father of the deposed Richard II. The Battle of Bosworth (22nd August 1485) brought closure to the dynastic war of the Red (Lancastrian) and White (Yorkist) Roses. However, memories of that Battle and the conflict of the Roses have headlined the news as the good people of Leicester prepare to give honourable burial to the last Plantagenet King, Richard III, in their Cathedral after he was discovered under a municipal car park. Chichele Road in our own Cricklewood is a local connection with the Great Cathedral of Canterbury. Henry Chichele, 60th Archbishop of Canterbury (1363-1443) is also buried in the Cathedral by the upper choir. Chichele founded All Souls College Oxford, which, and I surmise, owned land in the Boroughs of Barnet and the adjacent Brent hence Chichele Road. 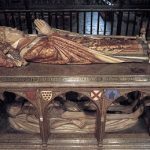 Henry Chichele is buried in a cadaver tomb which depicts his naked corpse on the lower level; while on the upper level he is shown resplendent in full archiepiscopal robes. The inscription on his tomb reads: “I was a pauper born then to primate raised. Now I am cut down and served up for worms. Behold my grave” – an accurate description except for “pauper” which was wide of the truth. Canterbury Cathedral, headquarters of the Anglican Communion, lies in the heart of the City of Canterbury. 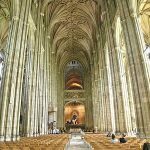 The ecclesial prominence of the Cathedral is the raison d’être for Canterbury’s importance both on the national and international stage and the reason why pilgrims and tourists flock to this small provincial Home County city. Its prominence has caused it to be listed as a UNESCO World Heritage site. The Cathedral was rightly our first port of call in the City of Canterbury, the base for our explorations of the Garden of England, Kent, and where we were comfortably housed in the well-appointed and excellent Best Western Hotel Barton Abbots. The Cathedral was the starting point of our explorations over the next five enjoyable, interesting and stimulating days. After arriving in Canterbury, the first building to strike one is a knapped flint and stone tower, all which is left of St George’s Church after the Baedeker night raid on the city on 1st June 1942. The plaque giving this information was placed here in 1992, the 50th anniversary of the bombing. Another plaque states that “Christopher Marlowe, dramatist, was baptised in the church 26 February 1564 and died at Deptford 30 May 1593” – a short life! Marlowe was assassinated in a tavern brawl possibly, so it is thought, either in a dispute over a bill or more likely due to his involvement in secret service activities. The Anglo-Saxon cathedral had been gutted by fire in 1067 and was a ruin. The first thing that Benedictine monk Lanfranc, later to become its Archbishop, did on his arrival in England in 1070 (with the backing of William the Conqueror) was to perform a re-build with Caen stone. It was encouraging that there was a full-access disabled route. I was led by a kind guide round the east end of the Cathedral past substantial, intriguingly hidden, Dissolution ruins, and to the cloisters (1396-1420). Here was an enlightened crypt access entry point; no need to dismount from my disabled steed here or in the crypt itself; but I could drive straight in and around! Inside, the low-light and unhurried, uncrowded ambience was very atmospheric, which was enhanced by candlelight. Here plain short pillars give way to a flourish of fanciful capitals, including tumblers and caricatures of zoomorphic musicians, which were carved vigorously and energetically; those at the west end are the earliest cushion capitals in England. Surprisingly, original chancel columns and 7th century (or disputably 9th century) cross fragments from Reculver’s Saxon Church are also to be found within. St Gabriel’s Chapel (c. 1110) has a fine display of wall-paintings which were preserved by chance. A special thanks to Jim for kindly arranging the hire, collection and return of the scooter from outstandingly helpful Finchley All-Mobility, together with our driver Gareth for the arduous task of knocking it down, re-assembling, and unloading/lifting it back into the coach at almost every stop of the holiday. 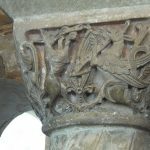 Figure 5: one of the capitals in St Gabriel’s Chapel. Whenever we go on holiday, if there is a river, seaside or Venetian canal nearby we always look for a boat trip. In Canterbury, it was a lovely sunny day for a trip along the river Stour. This river consists of a number of different branches. There was a choice between a punt and a rowing boat. We chose the rowing boat as being more stable. Setting off from a landing stage with a ducking stool by it, our own guide rowed us past various historic buildings, which reminded us even more of Venice, as they were mostly pizza restaurants. We had to duck as we went under some very low bridges, including the oldest road bridge in Great Britain. We passed a green, overgrown island, once the site of a Franciscan monastery. Passing the landing stage to go in the other direction we were in time to see the rower on another tour boat pitch over backwards and vanish under the surface. He quickly reappeared as the water was only a metre deep, but did not look too happy, and we had to chase after one of his oars. On the way back, we passed a modern building, the Marlowe Theatre, named after Canterbury’s famous playwright. The guide reminded us of the strange theory that Marlowe was not murdered, but escaped abroad, to act as a spy and write Shakespeare’s plays. I don’t know if he really believed this! With so much history, it comes as no surprise that that the city has several museums. Nearest to the Cathedral is the Roman Museum which boasts a Roman mosaic in situ. Like many Roman sites, it was discovered by accident. The dig itself is nicely documented. The Heritage Museum shows local history through the ages. It also invites you to re-visit childhood with the original film props for Bagpuss, the Clangers, the Pogles, Ivor the Engine and Noggin the Nog. All these characters featured in films by Oliver Postgate and Peter Firmin, who both came to live near Canterbury and began collaborating in 1958. Oliver Postgate wrote the stories, produced the films and animated the characters, which were made by Peter Firmin and his wife Joan. Many of the programmes were filmed in Firmin’s barn in Blean, just outside Canterbury. You can also meet Rupert Bear and his Canterbury creator Mary Tourtel in fun-packed displays. These include original illustrations by Tourtel and her successor, Albert Bestall, as well as memorabilia and images of the latest animated Rupert Bear. Mary Tourtel, who was born in Canterbury and studied art here, was asked by the Daily Express to invent a children’s character for the newspaper, to match those of rival press. Her creation, Rupert Bear, first appeared in the Daily Express on Monday 8 November 1920 in a single frame illustration to the story of ‘Little Lost Bear’, which continued daily. Tourtel illustrated and wrote Rupert stories until 1935, after which Albert Bestall continued the strip cartoons. Ted would not let me escape without mentioning the Beaney Art Museum and Library. This has displays of a number of historic artefacts. Most of the art is by local artists. 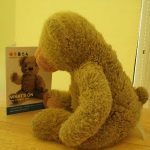 The highlight during our visit was on loan from the Victoria & Albert Museum – an extensive display entitled “The Teddy Bear Story”, telling the story of the “invention” of the articulated Teddy Bear, with lots of examples from Steiff up to the present day. I have just been reading David Berguer’s very timely new book with this title. It is an account of the First World War from the perspective of our part of North London; as the blurb says, it tells the story of how civilians coped with everything from sugar rationing to Zeppelin raids and how initial patriotism and optimism gave way to war weariness and a realisation that victory was by no means inevitable. The book discusses many aspects of the impact the war had, including those on taxation, and on the work of women. It contains a large number of illustrations, many culled from the Barnet Press, ranging from crudely anti-German cartoons to exhortations to eat less bread and to make cakes with egg-substitute. The many extracts from letters from men in the trenches are striking and moving; the Barnet Press encouraged people receiving such letters to send them in for publication (one describes the extraordinary Christmas truce of 1914 – though this particular company were forbidden by their officers to accept the challenge to a game of football). More remarkably, one young lady wrote long letters every week throughout the war to her fiancé who was serving in Egypt and Turkey; he kept them, and their daughter has allowed extracts to be published. Since she worked in the City, they reveal the impact of the war there, as well as in Muswell Hill, where she lived. The book has appendices listing the names on war memorials in Finchley, Friern Barnet and Whetstone, with biographical details as available, and of the Zeppelin and aeroplane raids in Britain. The book is published by Keith Martin’s Chaville Press (148 Friern Park). I thoroughly recommend it. Try FutureLearn. They are an online education company wholly owned by the Open University in partnership with 20 well know UK universities and other institutions. There are a number of courses to choose from, with more being added all the time. I am halfway through “England in the time of Richard III”. This is delivered online only over six weeks with a different theme each week. Other courses vary between 2 and 10 weeks. The time commitment again varies; mine being just 3 hours per week. There are a couple of Roman courses in there (Hadrian’s Wall & the archaeology of Portus), plus Shakespeare & Maritime Archaeology. Learners (as they are called), read articles, watch short videos, and listen to audio interviews. They then have to option to comment on the module which other learners can see and reply to. A really nice touch is the ability to download and print the video transcripts. At the end of each week there is a multiple choice test review which the computer scores and counts towards your overall mark. Due to the large number of participants, no direct contact is possible with the lecturer although I have seen her reply to a couple of comments on the blog. At the end of the course learners have the option of buying a “Statement of Participation”. These cost £24 each plus p&p. I was wondering how the company made their money and guess this could be one way. There is no obligation to purchase though. Friday 15th August, 7pm. C.O.L.A.S. Wapping Walkabout. Guided walk led by Peter Smith (qualified London Guide). Meet at Tower Hill station by bronze statue of Trajan. Lasts 2 hours. Cost £4 (non-members). Sunday 31st August, 3-5pm. Avenue House (now Stephens House & Gardens). East End Road, N3 3QE. Bothy Gardens Annual Garden Party. ALSO Sunday 17th August & Sunday 21st September, 1-5pm. Bothy Gardens Open Afternoon. HADAS are usually in the Garden Room on Sunday mornings from 10.30am. Monday 8th September, 3pm. Barnet Museum and Local History Society. Church House, Wood St, Barnet (opposite museum). Political causes of the First World War. Talk by Alan Smith. Visitors £2 (members free). ALSO Saturday 13th September. Coach outing to Ely Cathedral. For details contact Pat Alison at 37 Ladbroke Drive, Potters Bar, Herts EN6 1QR (tel 01707 858430) or email patron37@sky.com, or telephone Barnet Museum on 020 8440 8066. Tuesday 9th September, 7.45pm. Amateur Geological Society, The Parlour, St Margaret’s Church,Victoria Avenue N3 1BD (off Hendon Lane). Portals to the Past: geology and archaeology on the Crossrail Project. Talk by Jay Carver (Crossrail Lead Archaeologist). Wednesday 10th September, 7.45pm. Union Church Hall, Corner Ferme Park Road/Weston Park N8 9PX. Alexandra Palace: the way forward. Talk by Duncan Wilson. Visitors £2. Refreshments 7.40pm. Friday 12th September, 7.45pm. Enfield Archaeological Society. Jubilee Hall, 2 Parsonage Lane/Junction of Chase Side, Enfield EN2 0AJ. The Rose Theatre discovered & The Rose revealed. Presidential Address by Harvey Sheldon (also HADAS President). Visitors £1. Refreshments 7.30pm. Saturday 13th September, 10am. Enfield Society. Heritage walk around Edmonton. Led by Monica Smith with visits to Lamb’s Cottage & All Saints Church. To apply for tickets FREE please send SAE and include your telephone number to: Emma Halstead, Jubilee Hall, 2 Parsonage Lane, Enfield EN2 OAJ. (Maximum of 2 tickets per person). Jubilee Hall telephone number 020 8363 9495. Sunday 14th September, 11am-3pm. C.O.L.A.S. at the Tower of London for the Mayor’s Thames Festival. Together with the Thames Discovery Programme, Thames 21, Museum of London Docklands, Historic Royal Palaces & various other groups. Displays of ceramics, pipes, shoes & leather plus other foreshore finds. Wednesday 17th September, 7.30pm. Willesden Local History Society. St Mary’s Church Hall, Neasden Lane, NW10 2TS (near St Margaret’s Court). Willesden & the First World War. Talk by Margaret Pratt (General Secretary). Wednesday 17th September, 7.45pm. Edmonton Hundred Historical Society. Jubilee Hall, 2 Parsonage Lane, Enfield EN2 0AJ. Enfield’s Industrial Heritage. Talk by Stephen Gilburton. .
Friday 19th September, 7pm. C.O.L.A.S. St Olave’s Parish Hall, Mark Lane, EC3R 7NB. Life and Death in the Bronze Age of Southern England: new discoveries in the Thames Valley and beyond. Talk by Neil Wilkins. Visitors £2. Saturday 20th September, 11am-3pm. C.O.L.A.S at the Museum of London Docklands for the Mayor’s Thames Festival. Together with the various groups as on Sunday 14th September (above). Displays & activities. West India Quay, Hertsmere Road, E14 4AL. Saturday 20th & Sunday 21st September. London Open House Weekend. FREE access to over 800 buildings, including: Myddelton House & Gardens, Bulls Cross Enfield EN2 9HG (Saturday 10am-4pm), Three Mill House Mill, Three Mills Lane, Bromley-by-Bow, E3 3DU (Saturday & Sunday 11am-4pm). A guided tour of the grinding stones and waterwheels is available at this historic site which was the subject of the HADAS lecture in April 2014. Details at www.openhouselondon.org.uk. Sunday 21st September. Finchley Goes to War. Special commemorative walk led by Mark King (London Blue Badge Guide) will explore Finchley’s role in WW1, including a wide range of stories, various forms of memorial, home of the very first soldier to die in the war, public buildings that served as wartime hospitals, how Finchley’s green fields played a vital role in feeding local families, plus the famous “naked lady”. Starts at Henly’s Corner and includes a break at Stephens House. Details and booking at www.worldwaronewalks.com. Wednesday 24th September, 7.45pm. Friern Barnet & District Local History Society. North Middlesex Golf Club, The Manor House, Friern Barnet Lane, N20 0NL. Bugging the Nazis in WWII. Talk by Helen Fry. Non-members £2. Refreshments and bar. Thursday 25th September, 8pm. Finchley Society. Martin School, High Road, East Finchley N2 (entrance at the end of Plane Tree Walk). Outreach Meeting. Covering topics relevant to the East Finchley area. Visitors £2. (HADAS are digging here). Saturday 27th September. Enfield Society. Dugdale Centre, Enfield Museum, Thomas Hardy House, 39 London Road, Enfield EN2 6DS. Day Conference. Focusing on the current exhibition looking at World War I in Enfield. Talk by Ian Jones (EAS) along with re-enactors telling the story of the Cuffley airship crash and a soldier in WW1 uniform talking about his kit & weapons, plus a display of firearms and a presentation on the Lee Enfield Rifle. Tickets cost £13 and include lunch, morning coffee and afternoon tea. To book send SAE to “Study Day”, Jubilee Hall, 2 Parsonage Lane, Enfield EN2 0AJ. Please include your telephone number and enclose cheque for £13 made payable to “The Enfield Society”.